It's nice when we can tell a certain group of diet-restricted readers that a product that's okay for them is every bit as good as the "normal" version. Sonia will tell you that's almost the case here. I will beg to differ. If I were, in fact, on a strict vegan diet, I would just skip cream cheese altogether rather than settle for an odd imitation like this. Mind you, I'm not comparing this product to other vegan cream cheese spreads, because I've never had any other plain vegan cream cheese spreads. 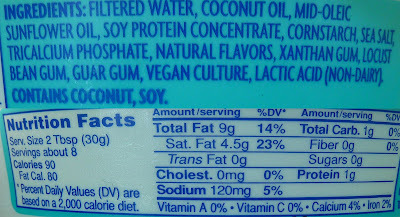 Yes, I know, I know...it's unfair to compare a vegan product with a real dairy product, especially since I'm not a vegan, but there's always the hope that it'll be a brilliant surprise like the recently-reviewed garlic spread dip was. Speaking of garlic spread dip, it's remarkably similar in texture and appearance to this product. Come to think of it, the taste is quite similar, as well—minus the garlic, of course. And since there's essentially no flavor at all other than garlic in the garlic spread, what I'm trying to say is that this "cream cheese" is extremely bland—totally void of any true cream flavor. It's just a couple of oils mixed with salt and stuff, as well as "vegan culture." Interesting. I knew vegans had a culture all their own, and that "vegan culture is on the rise," but I didn't know you could pack that whole way of life into a spreadable condiment. Now I know better. Just kidding. I'm sure that's referring to some kind of bacterial culture, which kind of grosses me out. I guess it's no weirder than cultures grown in cow's milk, though...which is also pretty weird if you start thinking about it too much. Sonia had this spread with some jelly and bread and really liked it that way. She says she can tell the difference between this product and regular cream cheese, but she thinks the difference is negligible. I must admit, it does knife out of the tub and spread very similarly to traditional cream cheese. I just had it on plain bread, and I felt it added very little in terms of flavor. After consuming, I felt a little goofy, too—like one might feel after consuming too much oil. My stomach was a bit upset and began complaining audibly. That's never something I'm looking for in a condiment. I think this is about a two star affair here for me. Sonia gives it the thumbs up, though. Put her down for four stars. Any vegans in the house? I'm curious as to how you feel about it. Let us know in the comments below. Bottom line: 6 out of 10. 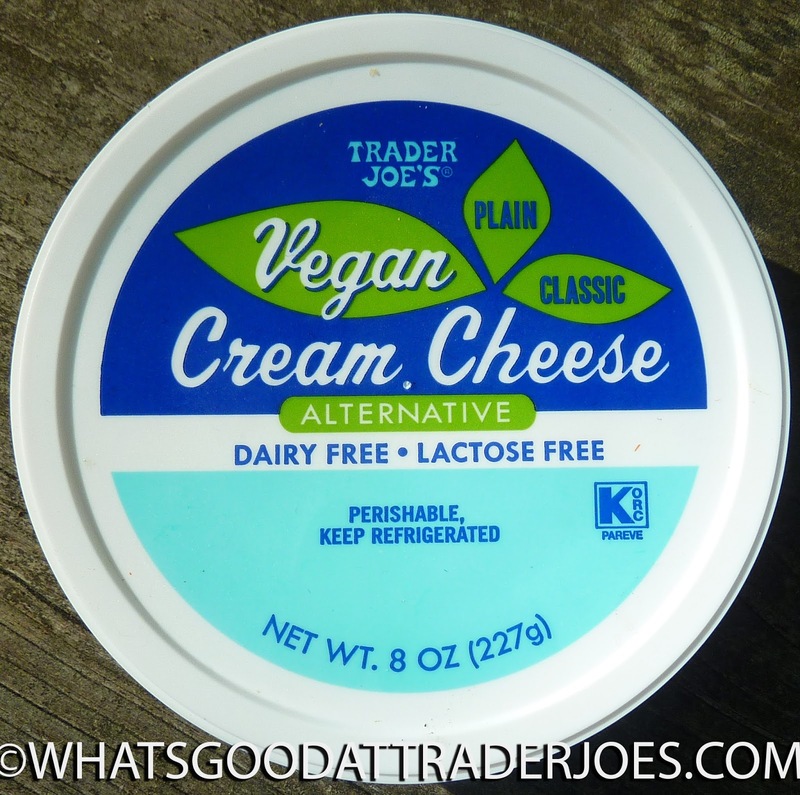 Vegan here!I personally find TJs to be the best vegan cream cheese around - it's not crazy similar to regular cream cheese, but it's the best vegan one I've found. Vegetarian who can't eat dairy right now here! I totally see where you're coming from in terms of eating this plain, but as a replacement in (some) recipes that call for cream cheese, it's really great. This is the recipe I always use this in: https://www.allrecipes.com/recipe/14041/delicious-black-bean-burritos/. I can't tell the difference between "real" and this cream cheese in this sort of recipe. It melts well and tastes creamy. Thank you for sharing this recipe, it looks fabulous. I plan to try it. TJs used to sell Tofutti cream cheese before they made their own. I’m probably biased because Tofutti was the first dairy free cream cheese i had after many years just doing without. TJs own version is pretty good but not eat by itself good- definitely better with jam or whatever. I’ve never had stomach issues from it. 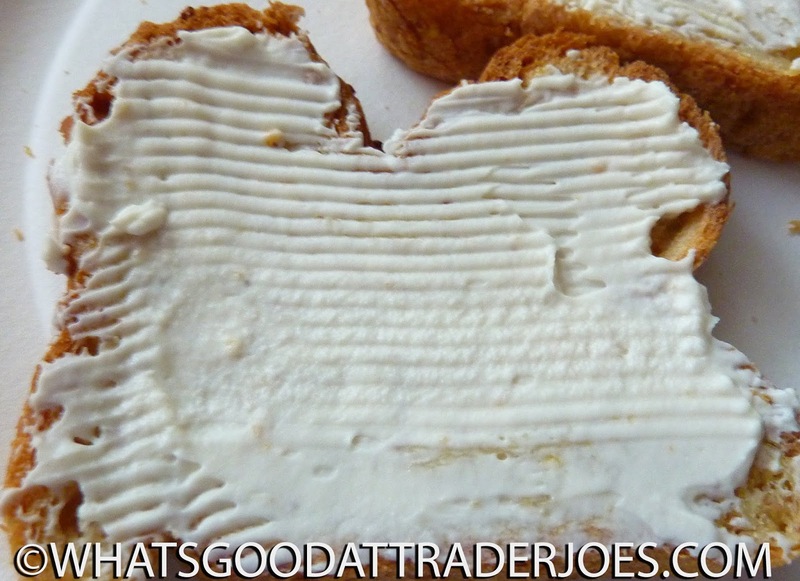 I actually really enjoy this cream cheese, both plan and in recipes. There's a creamy dip I often make that calls for a vegan cream cheese and this works perfectly. 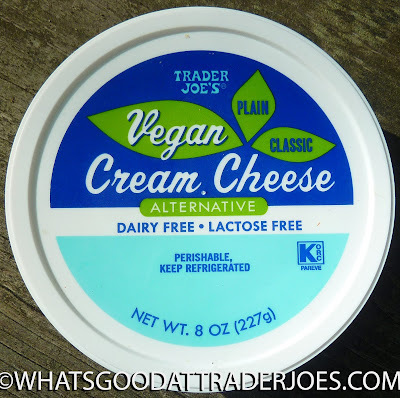 I prefer kite hill or homemade vegan creamcheese (which I culture with prbiotics, with a cashew base, and it's ridiculously easy) but when I need something quickly, this is a good and inexpensive option. It's a little silly to say the cultures are "weird" since that's in pretty much every cheese made with dairy. You can culture nuts too. This is my favorite vegan cream cheese!!! I love to put the TJ's Everything But The Bagel Seasoning on mine, it's delish!!! what is a VEGAN? A vegan (pronounced VEE-gun) is someone who, for various reasons, chooses to avoid using or consuming animal products. While vegetarians choose not to use flesh foods, vegans also avoid dairy and eggs, as well as fur, leather, wool, down, and cosmetics or chemical products tested on animals. why VEGAN? Veganism, the natural extension of vegetarianism, is an integral component of a cruelty-free lifestyle. Living Vegan provides numerous benefits to animals' lives, to the environment, and to our own health–through a healthy diet and lifestyle. Thanks for the review. I am vegetarian and I love cream cheese. When I cook vegan (which is often, as my husband is vegan) I use Tofutti and have found it indiscernable to "real" cream cheese in baking and cooking but I don't care for it as-is. I heard TJ's *might* be better, so I'm going to try it out in a vegan oreo cheesecake this weekend. Fingers crossed. I have a recipe for vegan soup and to make it creamy it calls for 8 oz vegan cream cheese. Has anyone tried it in something like this? I am hoping.it melts nice and soup looks appetizing and not curtled. Trader Joe's Gone Berry Crazy!